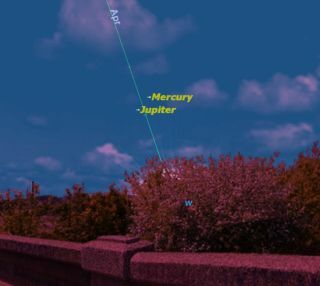 At sunset this week, there will be an unusual opportunity to see the elusive planet Mercury: Jupiter points the way. The planet Mercury is currently one of the five brightest objects in the sky, outshining all the stars except Sirius, with a NASA spacecraft due to take a closer look at the rocky world from orbit later this week. Mercury is one of the six brightest objects in the sky, currently outshining all the stars except Sirius. Only the sun, moon, Venus, and Jupiter are brighter. The sky map of Mercury here shows where to look to spot the planet over the next two weeks. NASA's Messenger spacecraft is poised to enter orbit around Mercury late Thursday (March 17) to begin taking up-close photos and measurements of its composition. And while it's taken Messenger more than six years to reach Mercury, spotting the planet from Earth has been an equally tough task for skywatchers. Why is Mercury such a tough target? So Mercury's orbit around the sun means that it can only be glimpsed against the twilight sky, just after sunset or just before sunrise. Usually the best way to find Mercury is to use binoculars to scan the western sky right after sunset. [WARNING: Never try this before sunset, as one look at the sun with binoculars can cause permanent blindness!] Once located with binoculars in the evening sky, it’s usually easy to spot Mercury with the naked eye. The next two weeks are one of the rare opportunities during the year when Mercury is at its highest at sunset, and the only one in the evening. But this applies only to observers in the Northern Hemisphere. Southern Hemisphere skywatchers will get their best opportunity to observe Mercury in late July. The current apparition is made even better because Mercury will be close in the sky to the planet Jupiter, more than a magnitude brighter than Mercury. The two will be particularly close Wednesday (March 16); less than 2 degrees apart. Look for Mercury just above and to the right of Jupiter. Over the next two weeks, Jupiter will gradually be sinking into the sunset, while Mercury will be riding higher in the sky each night, moving towards its greatest elongation from the Sun on Tuesday, March 22. Then Mercury begins sinking as well, and disappears into the sunset a few evenings later. Mercury is best appreciated with the naked eye or binoculars as a tiny spark glowing in the twilight. In a telescope it is a disappointment: a tiny "half moon" bubbling and boiling from turbulence in the Earth’s atmosphere. Enjoy this rare opportunity to let Jupiter help you find Mercury.